We work to ensure women’s priorities are central to peace and security decisions at all levels. To achieve this goal, we address social, cultural and political barriers and protection risks that limit women’s full participation in achieving and sustaining peace. It is well known that violent conflict disproportionately affects women and girls and intensifies pre-existing gender inequalities and discrimination. Women are also active agents of peace in armed conflict, yet their role as key players and change agents of peace has been largely unrecognized. Acknowledging and integrating the different understanding, experiences and capabilities of women into all aspects of UN peace operations is essential for the success of UN peacekeeping efforts and sustaining peace. UN Peacekeeping operations are mandated by the Security Council to implement the Security Council Resolutions on Women, Peace and Security across all peace functions. Security Council Resolution 1325 (2000) was the first resolution that recognized the disproportionate and unique impact of armed conflict on women and girls, acknowledged the contributions women and girls make to conflict prevention, peacekeeping, conflict resolution and peacebuilding and highlighted the importance of their equal and full participation, as active agents in peace and security. The seven subsequent resolutions on Women, Peace and Security (1820, 1888, 1889, 1960, 2106, 2122, 2242) have since been adopted, stressing the importance of women’s leadership and meaningful participation in the prevention and resolution of conflicts; addressing the impact of sexual violence; promoting the development and use of measures and standards for monitoring the implementation of women, peace and security mandates; training and capacity building on gender equality and women, peace and security for peacekeeping personnel; engaging with civil society more comprehensively and enabling an improved understanding of gender dynamics of conflict. 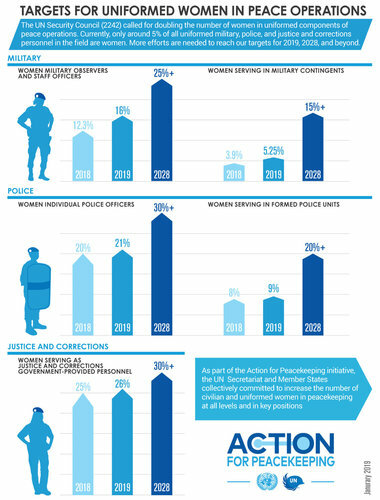 How does UN Peacekeeping integrate gender equality and women, peace and security into its work? The Departments of Peace Operations and Operational Support promote gender equality and women, peace and security through different approaches including through strengthening managerial leadership and accountability on implementation of the gender equality and women, peace and security mandates across UN Peacekeeping; strengthening systems and mechanisms for monitoring progress and producing analytical evidence-based progress reports; strengthening capacities and knowledge of all personnel —civilian, police and military— to advance the gender responsiveness of peacekeeping operations; and strengthening UN Peacekeeping engagement and partnerships with other UN entities and partners, internally and externally at Headquarters and in missions; to achieve gender equality and women, peace and security related results. You can view the DPO/DOS Policy on Gender Responsive United Nations Peacekeeping Operations to understand more about how gender equality and women, peace and security perspectives are integrated across all areas of our work including Security Sector Reform, Disarmament, Demobilization and Reintegration, Police and Military. How do Gender Advisers support the implementation of gender equality and women, peace and security mandates? To support this work Gender Advisers are deployed to all multi-dimensional peacekeeping missions to guarantee that a gender perspective is integrated across all peacekeeping functions. Gender Advisers and their teams work tirelessly to make sure that the voices, needs and priorities of women and girls are included in all functions and components of peacekeeping to promote their political participation and ensure that they are protected from sexual and gender-based violence. Advocating for strengthening and developing gender responsive security, justice and corrections institutions. Read some examples of how peacekeepers are working to empower women and implement Security Council Resolution 1325. UNAMID In Darfur, the Gender Unit established UNSCR 1325 Committees to monitor how the state governments implement their commitments to Resolutions 1325 and make sure women’s experiences are included in peace and security initiatives. MINUSTAH In Haiti the mission radio station, MINUSTAH FM, has a weekly programme dedicated to gender issues, for example, during the electoral period, this programme focused on women’s participation in elections and encouraged women to vote. MONUSCO In the DR Congo, women’s civil society are often involved in protection mechanisms at the grassroots level, such as Local Protection Committees trying to increase community resilience. MINUSCA In Central African Republic, we identified the protection needs of female ex-combatants, and introduced initiatives that encouraged women to develop skills to generate their own income, preparing them for employment and keeping them away from taking up arms. MINUSMA In Mali, the Gender Unit supported women's participation in the drafting and dissemination of the Malian national reconciliation Charter. UNFICYP In Cyprus, the mission organized a series of round table discussions addressing violence against women and women’s participation in peacebuilding, bringing together women’s organizations from Turkish Cypriot and Greek Cypriot communities. UNMIK In Kosovo, radio programmes on UNMIK’s Radio Ophelia, broadcasted in Albanian, Serbian and English include programmes on highlighting women’s property rights in Kosovo. UNIFIL In Lebanon, our gender expert reviews quick impact projects to guarantee the inclusion of women specific projects.